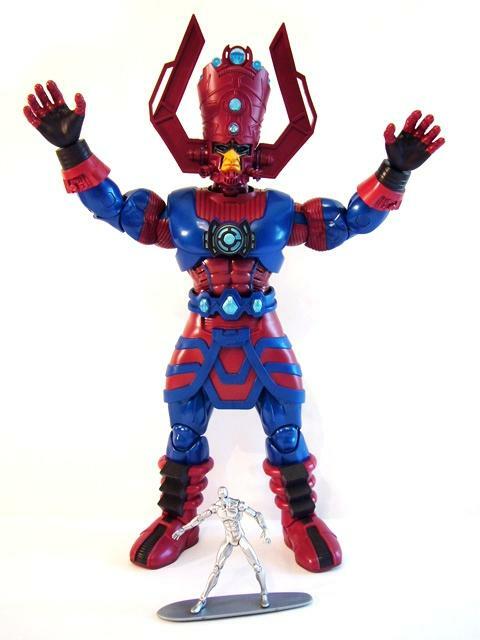 GALACTUS™ hungers! He eats entire worlds, consuming infinite quantities of matter to keep his massive form alive. As such, it might be a good idea to keep him in your collection so this 19-inch tall, articulated, and evil resident of the Marvel Universe won't go out and eat distant galaxies. As an added bonus, this boxed figure includes a 3 3/4-inch Silver Surfer, his herald! Don't miss this one... it's one of the biggest things Hasbro® has ever done for Marvel®! 19” Tall •Light-up head feature and speech technology; activated by chest button •Includes a 3.75 inch Silver Surfer Action Figure •Fantastic window-box packaging! Doomed to hunger eternally for the energy locked within life-bearing planets, GALACTUS™ wanders the spaceways in his world ship. His body is filled to bursting with the infinite Power Cosmic – a power that grants him absolute control over the fundamental nature of the universe around him. The forces that rule the lives of lesser beings are meaningless to GALACTUS™. For him, there is only the hunger he feels. A small fragment of his vast might has been granted to the SILVER SURFER™ – greatest of his heralds Once a man like any other on his home planet of Zenn-La®, the SILVER SURFER™ sacrificed his humanity to save his world. His mind and body changed forever by the power he now wields, he serves GALACTUS™ absolutely and without question. Together, herald and master are a force of nature, undeniable and inevitable.Inhabited worlds across the universe live in constant fear of the day when the shadow of mighty GALACTUS™ darkens their skies, for it is on that day their world will end. So it will be until the end of time, for GALACTUS™ will not be deterred, and he cannot be stopped. He will consume world after world until the universe completes its cycle and collapses in upon itself. Once a new universe is born out of the old, great GALACTUS™ will rise, and feed again. This gargantuan warrior not only looks fierce with his massive size and cosmic lights, he sounds impressive too — when you press the button, he says phrases like “Tremble at the might of the Power Cosmic” and “I am the devourer of worlds” It’s up to your SILVER SURFER™ figure to try to stop this huge villain from “destroying the world” Will he succeed? Set up the battle and find out.